We are trying our hand at growing peas this year. We planted Little Marvel peas from the cheap .20 cent seed packages I bought. We’ll see how they do! The Little Marvel pea is supposed to be a shorter vine. It is considered an old time favorite! It yields large dark green 3-inch pods with 6-9 large, sweet peas. Thrives in the cool temperatures of spring and fall. Great for freezing. My children love peas, so I am hoping that we can grow a small crop of them successfully. One of the side benefits of raising animals on our farm is that we have a lot of good compost! If I had extra kitchen scraps I would add those to our compost pile, but we need all of our kitchen scraps for animal food now. This year our compost pile had mostly old hay, grass clippings, leaves and cow manure that decomposed over the winter. We didn’t plow up our garden spot this year. Strange, I know….but it actually didn’t need to be plowed up. 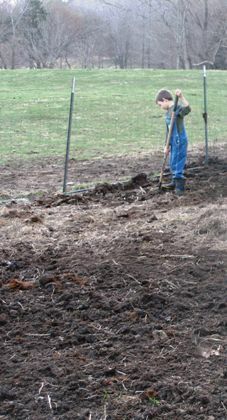 We left leaves and hay on it over the winter, so what didn’t decompose, we raked back and planted in the moist soil. We also spread out our compost over the garden area. 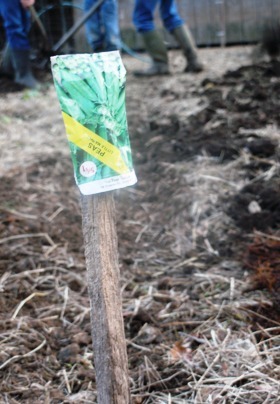 We noticed a large red worm population as we were spreading out the compost….which we were all very happy about. My 9 year old was telling everyone how beneficial garden worms are for the garden. Worms eat the dirt, chew it up and then spit it back out making really great dirt for plants to grow in. ← Lettuce Growing in the Garden on the First Day of Spring!